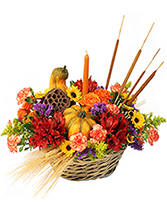 This colorful flower arrangement from ACACIA'S COUNTRY FLORIST is a great choice for Halloween and Harvest decorating themes. Seasonal accents like miniature pumpkins give it a special touch of fall festivity! 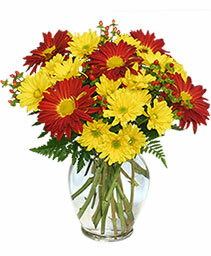 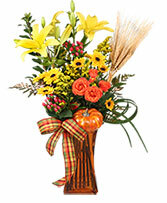 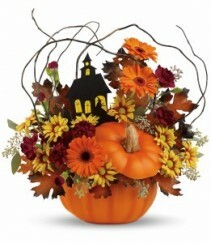 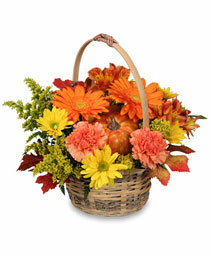 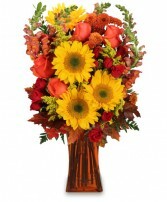 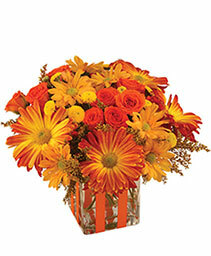 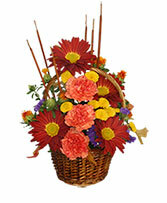 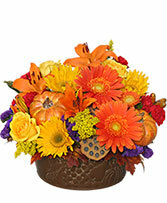 October Offerings from ACACIA'S COUNTRY FLORIST is a great choice for Halloween and Harvest decorating themes. Accented with dried wheat, mini pumpkin and seasonal ribbon, this flower arrangement beautifully captures the essence of fall! 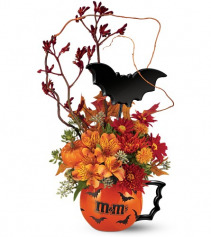 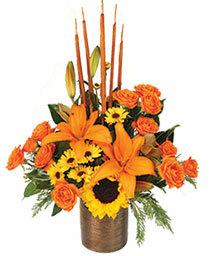 Celebrate Halloween in a whimsical way with this spook-tacular flower arrangement! 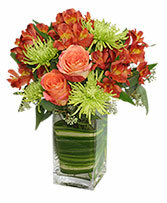 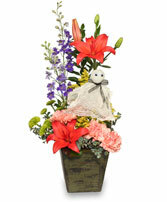 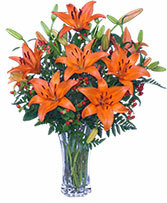 A charming ghost floats among an assortment of vibrant orange Asiatic lilies, purple larkspur, lime green novelty poms, orange carnations inside of an olive-green wooden container. 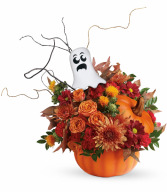 Send your little trick-or-treater a cute little spectre to liven up their Halloween night or party ! Halloween brings out the kid (and 'spook') in all of us with jack-o'-lanterns, trick-or-treating, and lots of Halloween activities to enjoy. 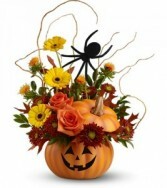 Your local florist, ACACIA'S COUNTRY FLORIST of Hesperia, is a great place to start for creative suggestions on Halloween flowers, party decorations, and haunted houses. Let us suggest some Halloween party flower ideas for kids, and maybe even a few tips grownup 'ghouls' will like too! 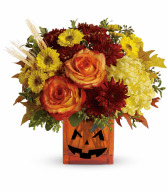 Give your Halloween festivities a 'frightfully' fantastic look and feel with colorful flowers and fun Halloween floral decor from ACACIA'S COUNTRY FLORIST.